Tens of thousands of Montessori schools around the world are celebrating this vibrant educational reform movement's first 100 years. This is a recording of a talk given by Montessori Foundation President, Tim Seldin, to Montessori educators on the outcomes of a Montessori education that we typically see in children by age twelve. It's a Bring Your Own Device World. Companies, schools, hospitals and other organizations must find ways to rapidly adopt protocols to let people access corporate systems safely and in compliance with industry regulations. Mobile Device Management by MaaS360 offers end-users simple enrollment and gives IT full control of iOS and Android devices. Build your desktop virtualization platform with VMware View on vSphere for industry leading high availability, business continuity, fault tolerance, reliability - and security. VMware View leverages VMware product innovations and deep integration to ensure not only world-class device mobility, but also a clear roadmap to a robust Cloud future, securely - all on the one platform. 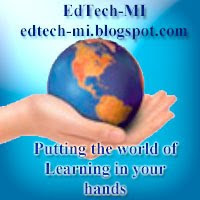 Author and edtech expert Rob Mancabelli explains why you need to attend Education Week's EdTech 2013 live events this year. At InfoComm 2011, Epson turned their BrightLink projector upside-down... literally! Using a Copernicus table clamp, the projector was mounted under the table and projects onto a plastic sheet mounted into the tabletop. The content remains interactive... just another cool use for this great product! With Amazon's April 2011 announcement that it'll be teaming up with OverDrive to support ebook loans to Kindle ereaders and apps, school librarians finally have a way to set up an ebook loan program that lets students download titles to virtually any device they choose to read on. It's called OverDrive School Download Library and Jeff Hastings checks it out in this video companion to his June, 2011 column available in School Library Journal and on SLJ.com. The Digital Bookmobile is a community outreach vehicle for public libraries to promote downloadable eBooks, audiobooks, music, and video. Developed inside a 74-foot, 18-wheel tractor-trailer, the nationally touring vehicle is a high-tech update of the traditional bookmobile that has served communities for decades. Give your students access to digital books and more — anytime — with School Download Library. Students can check out titles online, download to PC or Mac® to enjoy offline, and transfer them to MP3 players, eBook readers, and other portable devices. You build this digital collection based on grade level or school curriculum with digital titles available in virtually every subject. OverDrive offers support for Windows®, Mac®, iPod®, iPhone®, iPad®, Sony® Reader, NOOK™, Android™, and BlackBerry®. Users can also download EPUB eBooks and MP3 audiobooks from the library directly to their iPhone, iPad, Android, or BlackBerry with OverDrive's free apps. How to simplify your passwords with out giving up security. This also works with students, we have to figure out how to Intrinsically motivate students to want o learn. What future teachers need to consider when preparing students for the 21st Century. Bridging assessment and instruction like never before. In this video I show 16 New ipad tips for new users. I cover the basics from copy and pasting to multitasking. Kids love the iPad and educational apps. The beauty of the iPad tablet experience is it is a much more interactive and educational experience than passively watching television. Autistic children tend to process language more slowly than other children, they can cause confusion and anxiety. That may be the reason why those with autism tend to prefer interacting with inanimate objects but attractive as the iPad. They need extra motivation to learn. Both research and anecdotes suggest that the devices capture the attention of children. Another fact that combiene remember: the progress of these children is measured in small steps. And the iPad can help them walk. Using iPad apps as communication and learning tools for autistic and nonverbal children. Mobile platform games and education applications and accessories are highlighted. YouTube for Schools: Join the Global Classroom Today! YouTube for Schools lets schools access free educational YouTube videos while limiting access to other YouTube content. Students can learn from more than 400,000 educational videos, from well-known organizations like Stanford, PBS and TED, and from up-and-coming YouTube partners with millions of views, like Khan Academy, Steve Spangler Science and numberphile. Schools can also customize their YouTube for Schools experience, adding videos that are only viewable within their school network. Visit http://YouTube.com/Schools to learn more and sign up today. Today we’re happy to announce the Khan Academy’s brand-new Computer Science platform, it's an amazing way to learn programming! Hats off to our CS team: John Resig and interns Jamie Wong and Jessica Liu. Guy Martin, Managing Principal Architect at Red Hat, gives us the big reasons why companies shy away from using open source —and other misconceptions, like not being able to mix and match open and closed source applications and thinking open source is only about risk management. He advises those who want to see open source concepts and technologies implemented in their company to seek out and team up with like-minded coworkers. Martin's takeaway image is Bart Simpson writing at the chalkboard: Open source is good for me, I'm going to embrace it. Make spelling fun for kids by using a product that is easy to use and creates a engaged learning environment. If your school can't afford the cost you can still offer it to parents to buy to help there student learn. The premium packages allows you as a teacher more features and to help to keep track of how each student is doing. We did a test pilot of this package last year and it went very well. This is a 4 Min video that show an overview of how it works. WatchGuard's Corey Nachreiner shows you how to protect yourself from a botnet infection with five key steps. This is the final video in a three part series on threats to Internet security and the solutions available to organizations. Fri, 10 Aug 2012 15:21:00 Jamie Alexandre Until yesterday, embedding a Khan Academy video in your blog or website meant giving up features like point-tracking and multilingual subtitle support, by using YouTube’s default embed code. Now, using the Share > Embed option below a video on Khan Academy gives you embed code that allows you to provide a richer Khan Academy experience directly from your own site, allowing viewers to earn points, track progress, and view subtitles in multiple languages. Bud Has Mail - A video on how to watch for unsafe Email. Bud's latest misadventure teaches him what can go wrong when he clicks on a malicious email. Even non-technical users can learn from Bud how to handle email more safely. Download and use this informative video as a tool in your security awareness campaign. "Bud Logs In" brings entertaining flair to important and scientifically sound advice on how to create a highly secure password that you can live with. Whimsically produced in the style of the 1950s, "Bud Logs In" teaches an easy method for creating a password that is strong yet memorable. Watch Bud make every password mistake in the book -- until he masters a better way! Written and directed by D. Scott Pinzon, CISSP. Instructors may obtain free copies by emailing lsseditor at watchguard dot com. Visit http://www.universityninja.com for more helpful tips. Everyday everyone's going more digital. We use laptops to write our documents more and we even have devices like an Amazon Kindle which can digitally transport thousands of books. Have you ever conceived the idea of throwing away the heavy textbook and going PDF? Before I continue, I just want to mention that I'm not advocating the following. I'm just letting you know that it can be done. Here's some things to consider. 1. Not all books can be found online. You may be more lucky to find a solutions manual of a textbook over the actual book itself. On the other hand, that might not be bad at all. 2. Obviously its illegal to obtain these books in these formats without paying for them. Not all publishing companies offer PDF version of their books to students or solutions manuals. Usually these text are intended for teachers. In addition, there are copyright laws and all that other goodness you should be cautious about. 3. Make sure to invest in a larger monitor, maybe a Dell or Apple. Make sure it's like 20in or more. Trust me, trying to read documents on a small laptop screen is the last thing you want. Even worse, trying to read it on an iPhone or small netbook can do even worst things to your eyes. 4. Be willing to accept the consequences if caught. 4. Last of all, perseverance. Don't expect to find the book on your first try, it takes some trial and error. 4. Peruse the search results looking into forums, rapidlibrary.com, and other search engines of rapidshare. 6. Begin downloading files and confirm whether or not you got the file you were looking for. 7. Repeat steps 3-6 while alternating search names and sifting through websites. Finding the digital copy of a textbook is almost like finding a needle in a haystack. It can be difficult and frustrating. At the end of the day you might not even find what you are looking for. However, you shouldn't be angry. I mean, you were trying to get it for free in the first place. 1. You might have found links, but they were dead. IF THIS DID NOT WORK FOR YOU, THERE'S ALWAYS ANOTHER WAY TO NINJA YOUR BOOK. Learn how to use Respondus 4.0 and publisher test banks. There is no faster way to create exams and publish them to an online course! This video shows how to use this product to create online testing. Examview is another software company that has did this. Creating online exams with publisher test banks doesn’t have to be slow and tedious. With the Respondus Test Bank Network, instructors create assessments in minutes, not hours. Over 4,000 official publisher test banks are available, and everything integrates seamlessly with Blackboard, Canvas, Desire2Learn, Moodle, and other learning systems. Are you ready to save some time? EdmodoCon 2012 8/8/12 Gather online with Edmodo educators across the globe for a remarkable day of professional development. Teachers will share, inspire, and showcase ways they are using Edmodo and other digital tools in the classroom. Come celebrate being a teacher! You may have had success with Deep Freeze on your lab computers, but how about those staff and teacher computers that often result in bigger IT headaches? Faronics Anti-Executable is the perfect solution for protecting those computers without Deep Freeze -- during run time, not just upon reboot. WatchGuard Technologies XTM Network Security Appliances, make managing and securing mobile devices easier. This demo shows you how to setup secure iOS connectivity, providing the corporate web security your company requires with the data security solutions you want for your iPhone®, iPad® and iPod touch® users. The XTM appliances give network administrators a superior way to manage, monitor, and secure mobile devices, information, and applications. Link to a video on how they stack up competing with each other. Got 3 minutes? See all the ways Spiceworks can simplify your IT day. A live weekly discussion of the upcoming release of Spiceworks 6 from Spiceworks HQ! Google NOW stands to compete directly with Siri and looks like it will beat it! Top 5 Android 4.1 Jellybean Features! The best of Android 4.1 Jellybean features on the Galaxy Nexus! Thumbs up! Google is free to education. Why would you want to pay for a tool to do word documents and spread sheets when you could use Google apps. Compass Learning Asks: What's Biggest Challenge Facing Education Today? Compass Learning interviewed attendees at the recent ISTE 2012 conference to get their take on the biggest challenge facing education right now. Here are answers from a few of the educators at the conference. Learn how Compass Learning is addressing these educational challenges at www.compasslearning.com/solutions. Compass Learning and how online learning is changing in this modern world.